Legendary Iranian singer, Ebi will be performing in the Royal Albert Hall, London on April 20th. There is a difference to this concert from the other Iranian concerts being performed these days for the Nowruz celebrations. This concert is being organised by the Persian Community for Multiple Sclerosis (PC4MS), whose aim is to raise awareness of MS and its prevalence in Persian communities, as well as helping to fund research into MS. All the profits from this concert will go to UK-registered charities and the largest portion will be donated to the MS Society for use in research. Ebi is also a staunch supporter of the Green Movement. So what would be more appropriate to turn up for the concert with pictures of Hamed Rouhinejad, the Iranian philosophy student from Beheshti university who suffers from MS and was arrested 40 days before last June's elections and sentenced to execution. 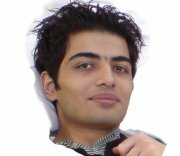 His death sentence seems to have been commuted now but Hamed has been detained in Evin prison ever since.